Food Delivery Business is the current flavor of startups. Low entry barriers have helped many to launch this business. This vertical is one more addition to the asset less / aggregator business models that already exists in the areas of travel, healthcare, taxi segment etc. Explosive growth of smartphones and apps development are the enablers of food delivery business. A food delivery company is one which takes customer order on its system and transfers it to a food production unit/restaurant, followed by a delivery boy picking up the order from the restaurant and delivering it to the customer. While their core proposition remains convenience for customers, food delivery startups do not do food quality control. Unfortunately, the core value proposition for the customer is slightly different; the taste and the quality of food are something they cannot influence..
Of late, we are witnessing the closing of a few food delivery businesses in spite of the fact that they were funded by Venture Capitalists. Dazo, Spoonjoy and Langhar have exited the business or have scaled down their operations. Another unfavorable factor is ,that most restaurants have their own free delivery system for a minimum order for people living within a particular radius. Having a good idea and executing it are two different things. 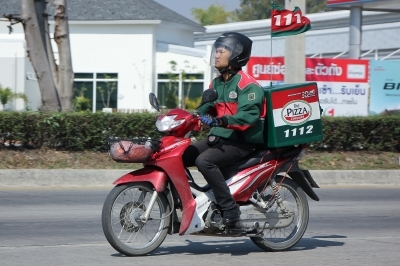 Customers expect delivery at a specific time and the food has to remain hot. The delivery business has to make money by having the lowest delivery cost. The delivery has peaks and valleys on any given day and how to optimize human resources is important. The customer is the fulcrum in planning delivery business. What types of food is being ordered currently and how is the spread of the menu? The requirement during week days can be different from weekends. One has to cater to the entire family requirements. The characteristics of this business may require to be hyper local. The distance between the customers and the restaurants should not be more than 15-20 minutes for delivering the order. 3. Service Expectations from restaurant- The aggregator does not have control over quality of food. 4. A startup should swim in shallow waters, first, by supplying in a small territory. We have unequivocally the largest restaurant base in India and we will work closely with Pickingo, Grab, and Delhivery to improve the last-mile delivery experience for users placing orders online on Zomato. So far, restaurants have been delivering on their own, but with this partnership, we will also be able to target restaurants across the country that don’t otherwise deliver. We are also launching our online ordering service in Dubai, Australia, and South Africa later this month. Along similar lines, we are also in conversation with hyperlocal logistics firms in other countries to ensure that we are able to provide a seamless and quality experience to our users there. This investment will not only infuse funds into the company but will also allow us to scale rapidly with Zomato’s online ordering business, while also leveraging Zomato’s strong relationship with restaurants across the country. We have already started working together to deliver from select restaurants in New Delhi, and we look forward to taking this partnership further. Pets are not only just companions but they are also becoming style statement for pet owners. Every year, around 60,000 pets are adopted and this growing number of pets is giving birth to various small and medium enterprises dealing in pet care. Pet s like cat, dog etc. are attracting attention as their owners are willing to get a healthy diet from third parties. The business is expanding rapidly, at least, in major metros. Pet food is the fastest growing area when we talk about Indian pet industry. Because pet owners have lack of time, they prefer commercial pet food over homemade food for their pets. In the words of Vijyendra Thapliyal, owner at Pets World, a prominent pet food company based in Noida- "The trend of providing premium pet food is growing at a remarkable pace nowadays especially among the urbans. This rise in demand has increased the competition among the pet food company which gradually resulted in increase in food quality and prices becoming more competitive. That's a great benefit for pet owners!" Food delivery business is attracting many new players and also has caught the attention of investors. The recent collapse of a few food startups, even though armed with experienced VC funding, has created doubts about survival of this model. Food delivery to pets is also a fast growing vertical. Obviously, pets do not give feedback but the owners are happy if the pets enjoy the food. Startup failure and closure of unviable business models are not new in the entrepreneurial world. According to Shahdadpuri , only two categories of businesses will survive in the end. One, where the startups have a viable business model and understanding of all areas of the value chain. And second, where startups are lucky enough to be funded by VCs with very large pockets so that they are able to fine tune their model despite cash losses.